Synchronicity directs the blog this week. 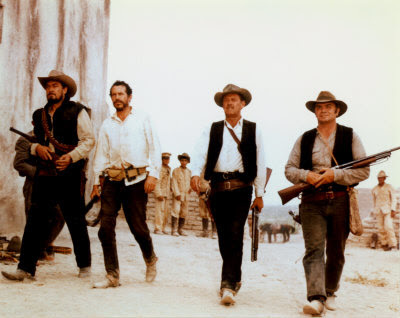 Only a day after re-watching The Little Train Robbery, I saw The Wild Bunch (1969) for the first time. Since I avoid synopses of films I’ve never seen, I knew little about The Wild Bunch, other than its genre and its stars. So it was a surprise, and a warm one, to discover how much this film and The Little Train Robbery enrich one another. What is irreverent in the first film is lethal in the second, and so’s born much to think about. The Little Train Robbery is a ten-minute spoof of The Great Train Robbery (1903), one of cinema’s first blockbusters. Edwin S. Porter, director of both films, saw lucre in revising his hit western as a light comedy in which the parts were played by children. This was a common gimmick at the time. The Little Train Robbery follows a gang of kids as they hold up a child-sized theme-park train and steal the passengers’ candy. It is quick-paced and not too ambitious. The juxtaposition between theatrical sets and outdoor scenes, which made its predecessor so interesting, is not present here. It is simply an extended joke, and chances are, you won’t laugh at it. This is not because The Little Train Robbery is poorly done. It’s just that juvenile delinquency, especially the very violent kind, doesn’t strike us as funny anymore. We’re sensitive, these days, to images of children committing crimes; we’ve seen the consequences these crimes can have, and fixate on whatever violent images may have twisted a child enough to commit them. And so this slapdash comic short from 1905 becomes, for us, a harbinger of sinister trends. The Little Train Robbery opens with a group of children—aged nine to thirteen, I’d say—playing in their clubhouse. Most of them are dressed in quasi-Western clothing. Posters for adventure-themed plays, movies and magazines cover the walls. The gang’s leader, a young girl, arrives at the clubhouse with another child, who is blindfolded. The boys put on masks, and she smiles. The boys’ crime spree begins immediately afterward, as they head to a nearby barn and steal horses. While The Great Train Robbery was a period piece, based on a 19th-century play, The Little Train Robbery never specifies an era. It does seem contemporary with its time. And that would be a time when a gang of kids could grow up mesmerized by ‘great’ train robbers and their adventures in print, on stage, and especially on screen. Maybe they saw the first movie. We wonder where their parents are right now. Of course, children emulate those they idolize. Like the killers in the 1903 film, these boys crouch out of sight and await the arrival of the passenger train they’re planning to rob. In this case, the train is a miniature engine, pulling open-top cars filled with other children. It’s touring the countryside, helmed by an adult whose long legs straddle the engine as he drives. Arriving at a point on the track flanked by steep ditches, he stops to remove a board laid across the track. We know, though he does not, that the board has been placed there by the gang. When the engineer dismounts, the boys rush up and knock him cold with the blunt end of a hatchet. He tumbles into the ditch and the passengers are robbed of their candy. The little hoodlums escape. The rest of The Little Train Robbery is a chase, as the police, the (recovered) engineer and other locals pursue the kids through the forest, eventually driving them into a lake, where they are captured. We never really catch up to them, though. We never leave that scene where they nearly kill the engineer. I thought about this as I watched The Wild Bunch, a film also about children inspired by childish adults. Its protagonist, Pike (William Holden) is a worn-down bank robber looking for one last score; he’s in a violent profession, but he’s got principles. Some younger members of his gang do not. And those too young to be in any gang fixate on him, and his fellow crooks, and even the trumped-up Mexican general they oppose. Set in 1913—eight years after The Little Train Robbery was filmed, The Wild Bunch shows us what happens when the man-child rises to positions of frightening authority. Director Sam Peckinpah symbolizes it best through his Mexican general, Mapache; a drunken clown in a uniform who, when presented with a machine gun, proceeds to empty his new toy into a crowded square. A little boy in a matching uniform looks up to him. The Wild Bunch has much in common with No Country for Old Men (2007). Both are chronicles of cultural decline, presenting it as inevitable, relentless, and ever more brutal. Characters in these films pine for the days when misbehaviour did not bear the seeds of greater menace. The nihilism of their stories defeats all hope. I’d say the greatest argument against these films is the fact they were filmed 40 years apart. But they will always be powerful, because they draw upon the deep unease we bring into the theatre with us, and that unease is born, in part, from the fear that we did too little to prevent our society from becoming what it is. If only we’d taken things more seriously, back when it could have made a difference. Movies that tell of a coming storm cannot end happily. And so The Little Train Robbery, blissfully innocent though it is, stays true to form. In his final scene, Porter shows us the row of captured bandits, tied together by the wrists and being marched, we assume, to their waiting parents. The girl behind it all is roped last in line, and she gets away. We knew she had to, one way or another. The Little Train Robbery can be found on Disc Two of Kino International’s must-have, four-disc set, Edison: The Invention of the Movies. The film is preceded by a short commentary from several film scholars. Look for it here.